Look at the knockers on that! Madrid has a lot of big doors. 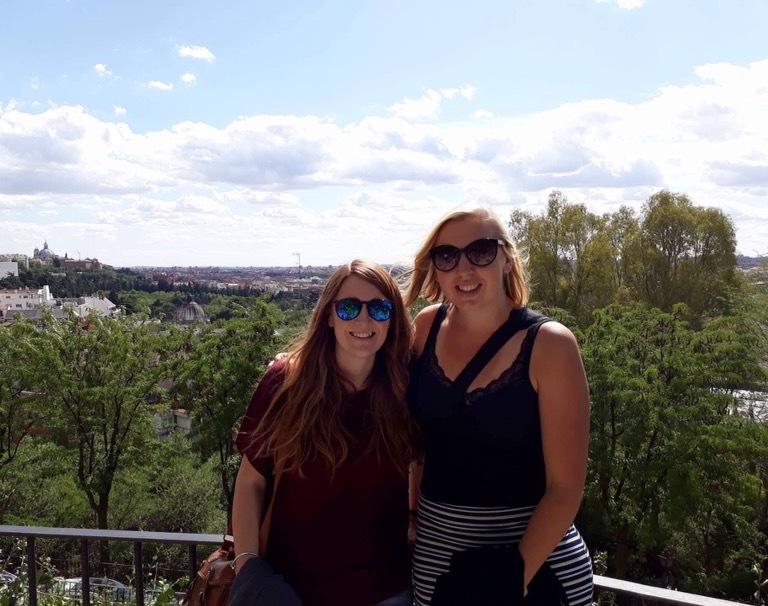 Stacey and I were off to weekend for an adventure in the Spanish sun. The adventure started on the runway, as apparently the pilot was getting paid per landing and decided to do ours twice. We touched down for a few metres before accelerating up again. A neck wrenching climb later, we circled steeply and then finally deciding to answer our minds questions, the captain explained there was strong winds and we would make a second approach. The land below was brown and flat for miles around, with faint hills protruding on the horizon. Safely touched down, we took the metro to the city centre, and three line changes later, disembarked at Tirso de Molina. Parched and ready for Paella, we went straight to a restaurant with tables sprawling throughout the sunny square. We weren’t messing around. We went straight for Paella and Sangria. The holiday had begun. The afternoon had crept on, and in the early evening we explored the streets, heading nowhere in particular. 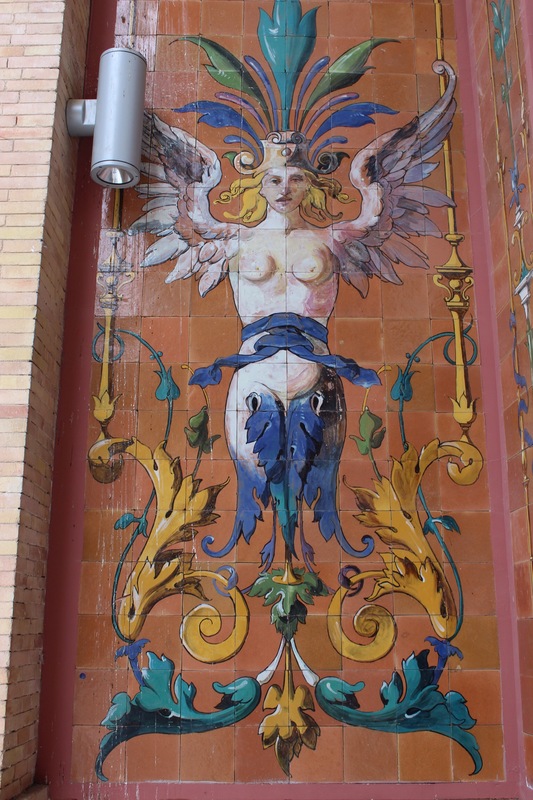 From our observations, there was lots of icons of Catholicism on every street sign and building side. 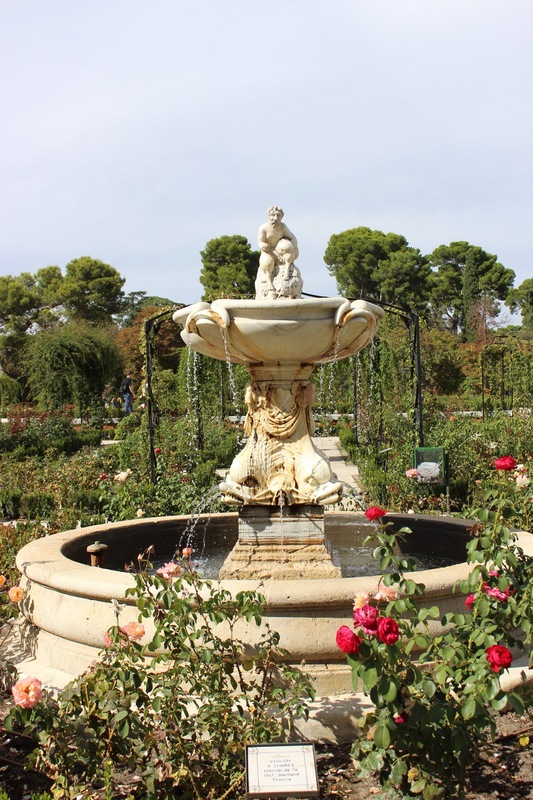 The city was green, an oasis in dry lands, and many parks opened out from grand fronted buildings. 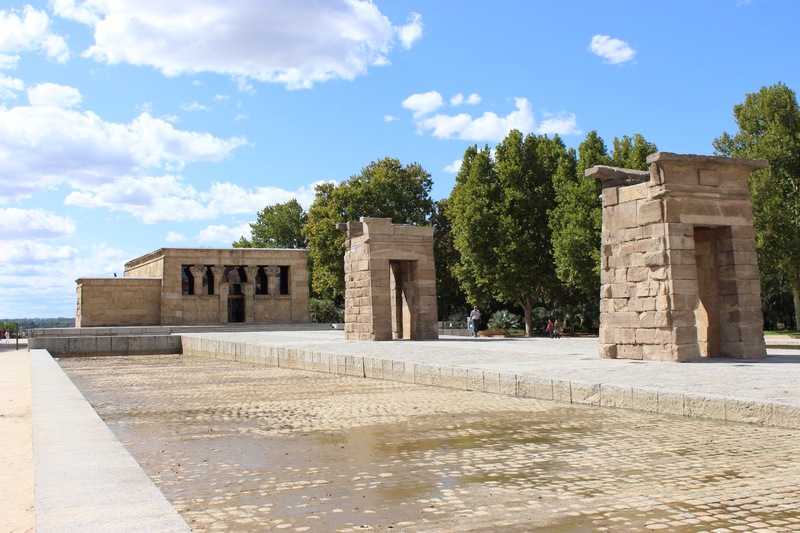 That being said, the name Madrid is supposed to be a corruption on the Arabic Mahadrid meaning plenty of water, still it felt strange for a city not to be based around a significant body of water. We had dinner on the street side out the front of the restaurant where waiters completed for the passing business. Enjoying our meals, almost as much as the dodgy menu translations, the police came along and began instructing the packing away of all the outside tables. We were going well with a jug of sangria by this point and got ready to move as all of our neighbours were moved along. ‘Not for you’ was the reply that came. Apparently we were destined to be the only table left outside enjoying our evening. Confused, we obliged and sat while everything was packed away around us. A Madrid mystery. The following morning we joined the hostel walking tour to make sense of the grandeur we had seen the big before. 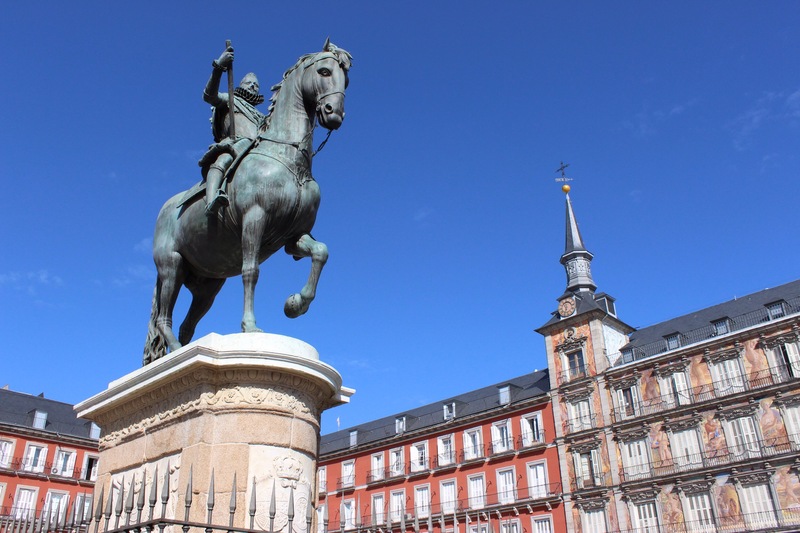 Plaza Mayor, the grand square was the first building in Madrid built in the year 14. The stories its balconied walls could tell involve pomp and parade, execution and drama, and now for the most part, creative busking and al fresco dining. Every time you cross the square there is musical accompaniment, either by brass band or tinny phone speaker from gathering crowds. 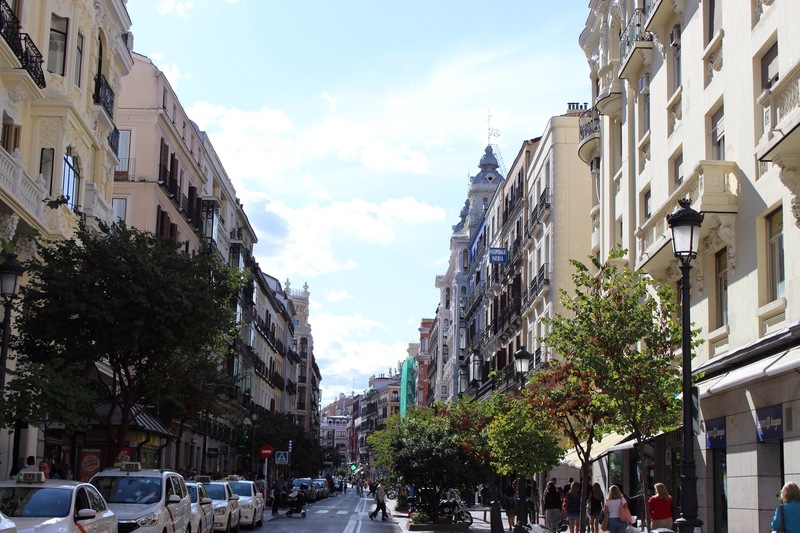 We passed down Calle de Arenal, with its many souvenir shops and tall buildings. 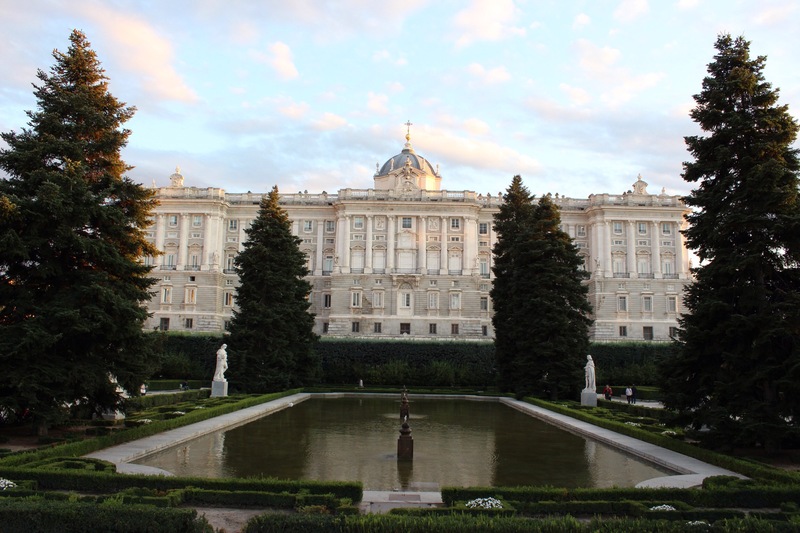 All routes seemingly lead to Plaza Oriental and the highly decorated gardens by the Royal Palace and grand cathedral. 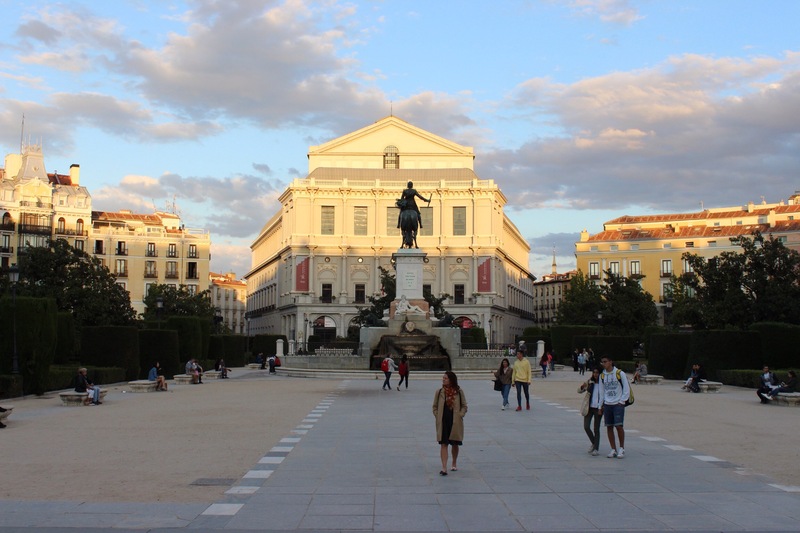 In the middle of the square is a statue of King Philip IV, a statue he designed and commissioned to celebrate his own reign despite being widely unpopular. 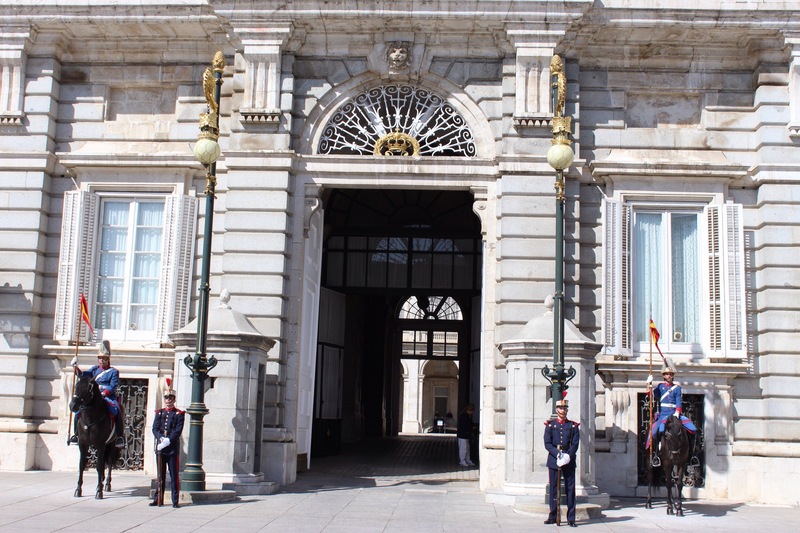 At noon, the changing of the guard saw horses and soldiers parade rhythmically at the palace entrance. 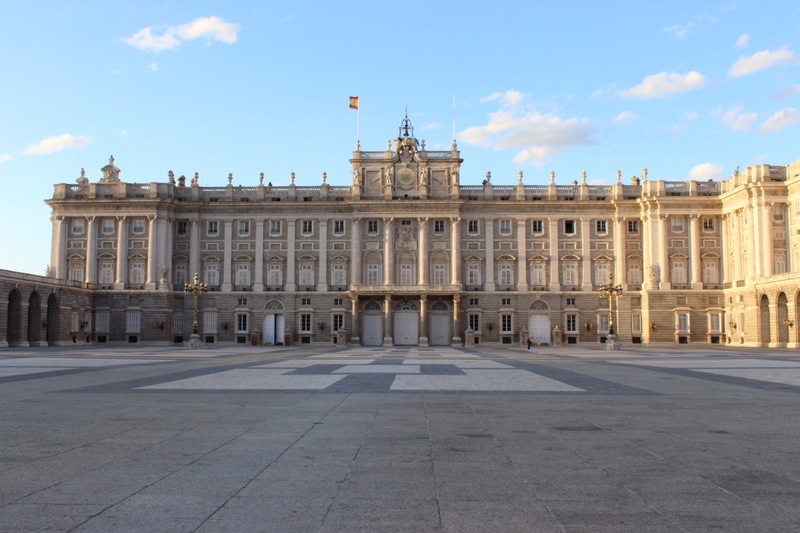 The palace has ornate exteriors, unlike its religious counterpart, the cathedral which is the same shape, size and sits opposite, but plan in design. Pride dictated that these buildings be equal in size and therefore importance. 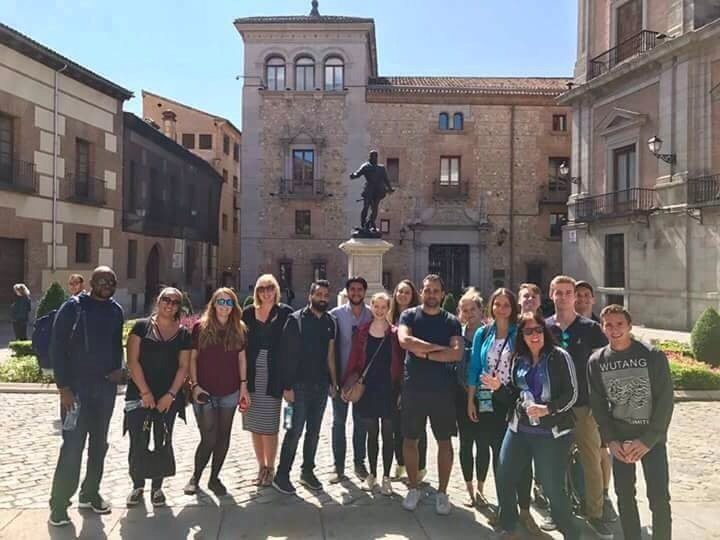 Arguably the most interesting thing we learnt was the historic significance of Spanish delicacies, all stemming from less appetising parts of the past; Spanish Inquisition and the Black Plague. The Spanish love of pork came about during the periods of religious fanaticism which initiated the inquisition. While anyone other than Catholics were being persecuted, pork was used to root out other faiths, namely Judaism and Islam who both consider the meat impure. While great measures were being taken, adopting Catholic names of Maria and Carlos, diet was used as a way to root out differing beliefs. 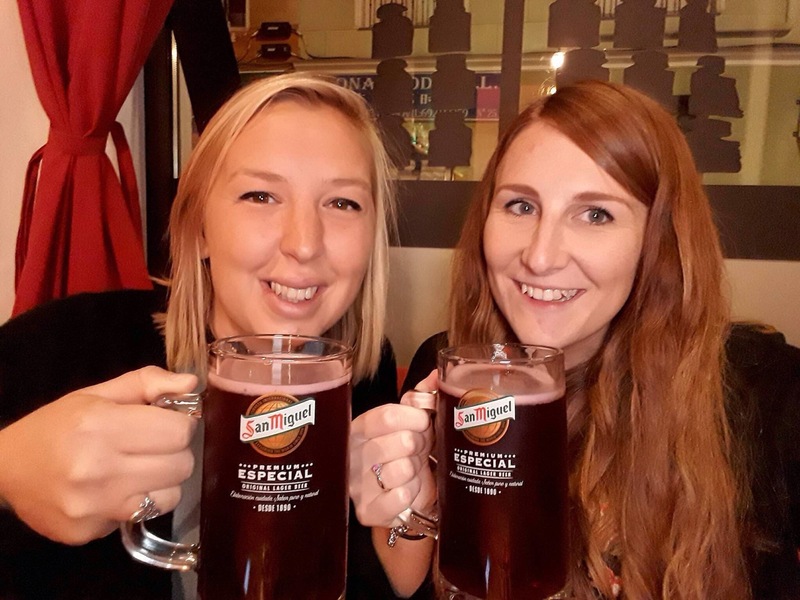 Sangria came about as a solution to contaminated water during the Black Plague, red wine diluted with fruit juices seemed like a typically Spanish acceptable compromise to quenching thirst without being constantly drunk. 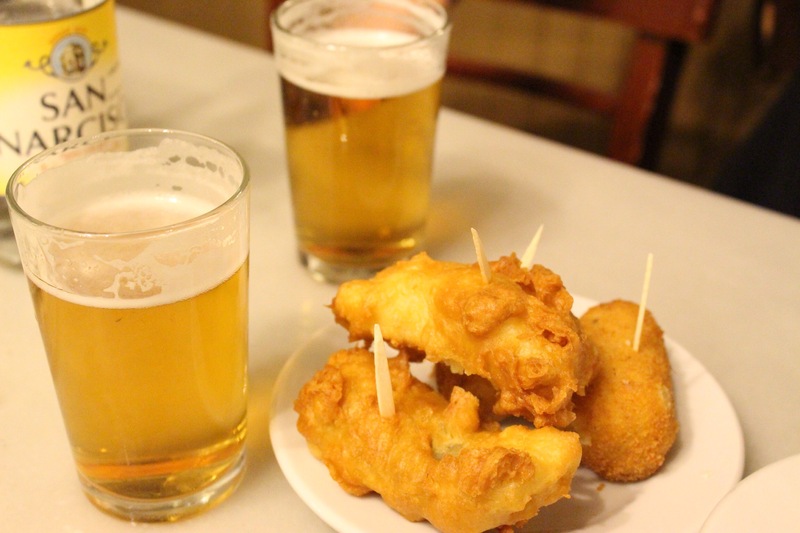 Tapas literally means top and the small plates of food were used to top the glass to prevent disease carrying flys from contaminating the drink. All the food talk meant we needed to sample another Spanish goody, Churros. At Chocolateria San Gines the menu is simple. 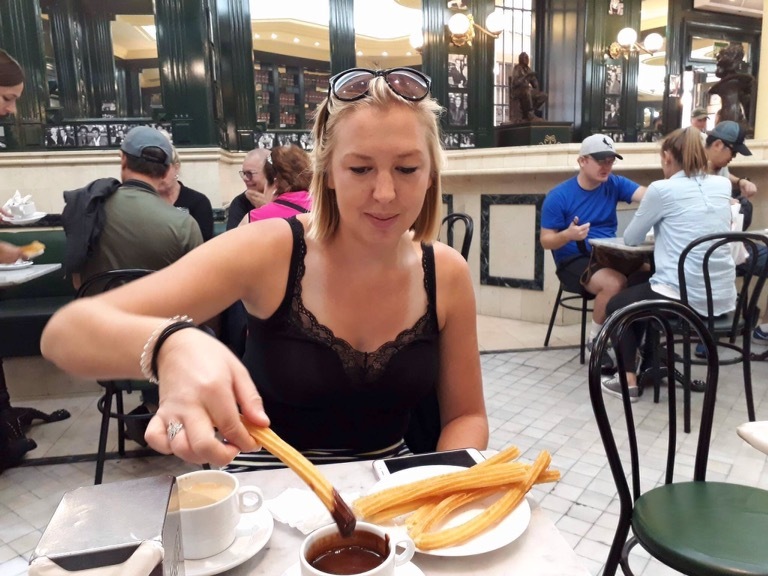 6 Churros and chocolate served in their historic diner, open since the 1894, and even now serving close on 20 hours a day. Pounding the pavements once more we headed north to the Temple of Debod, rescued from Egypt in the 1960’s when the Damming of the Nile would have rerouted the water through this sacred monument. 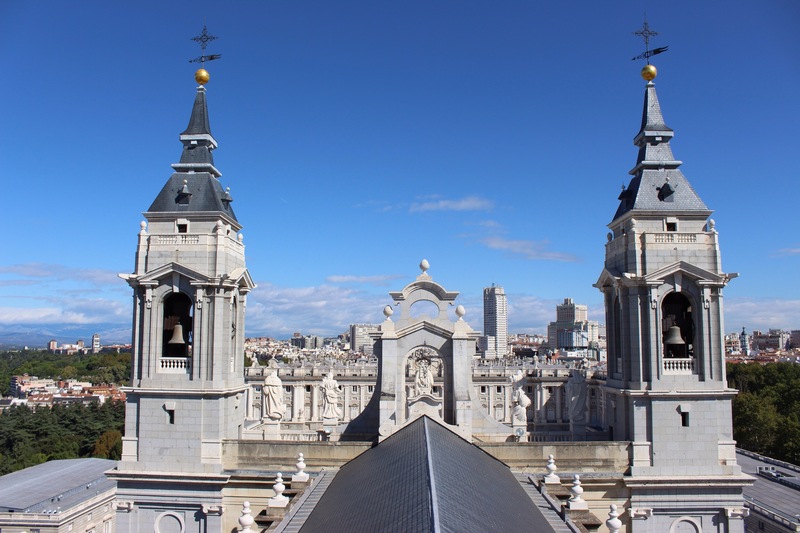 The preserved artefact sits with an enviable view over the low green lands of Madrid and the view back to the Royal quarter. We explored below the city in the crypts where important religious and royal figures were buried, then made for Mercado de San Miguel. This market experience was slightly more upmarket, each stall specialising in fruits, empanadas, tapas or little collections of wines. It’s uniform design, all housed in a glass building was a beautiful extension of modern design, with a slightly fancy feel. 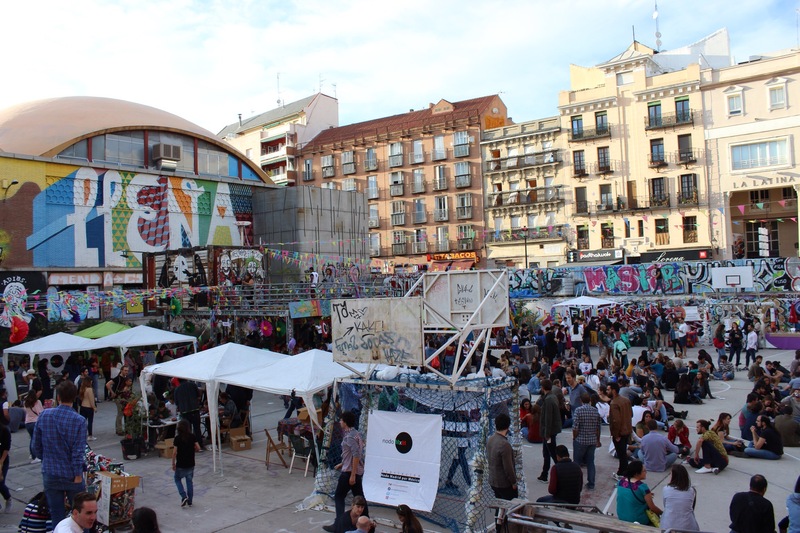 It was Saturday afternoon and after a beer in the sun, we came across a festival happening in La Latina, a cool area of art and grafitti in our neighbourhood. Inside corrugated iron fences an explosion of colour and music was happening. Many people had brought a few beers and friends and were sitting around on what looked like an abandoned car park celebrating the Mexican tradition of the day of the dead. The atmosphere was intriguing and we joined in, grabbing a bottle of sangria from the shop and spending the late afternoon in the sun. Another thing to experience was the Madrid nightlife. 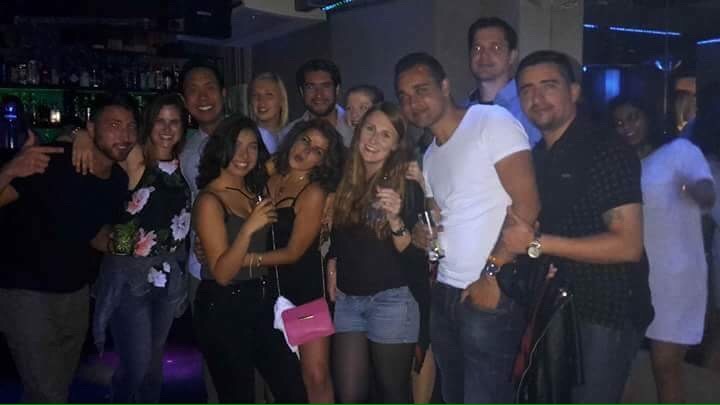 Our hostel was sociable and after sharing a meal with other guests, we joined a bar crawl. With the relaxed pattern of the day, dinner beginning often at 9pm, we didn’t leave the hostel until 11.30, hit a few bars and made for the nightclub at around half past three -kicking out time back home. The club was packed, lots of Spanish music, interspersed with rap which wasn’t the easiest to dance to, and so when we headed home at 4.30, with a quick stop at the pastry shop, I’m sure we were some of the first. The long nights stretch to 6 or 7am typically. Sunday morning market fever was in full force. As we stepped into the streets, they were alive with people, stalls and cheap produce. Leather and spices, t shirts and toot. We per used at the pace that the crowd allowed through El Rastro until we were spat out the bottom, unscathed with tat but ready for a picnic. 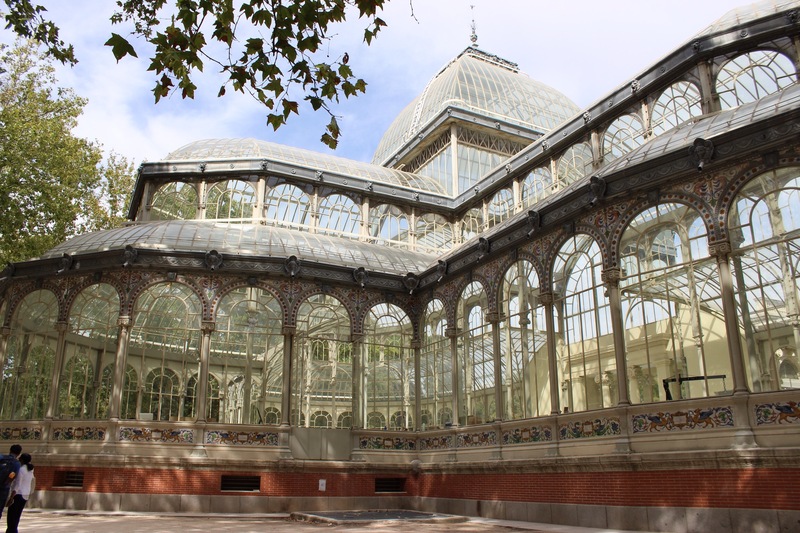 El Retiro park is on the east side end of Gran Via, the Main Street. Fully armed with a picnic we made our way through the monumental buildings and into greenery where people with skates and couples on a slow parade gave us the Sunday feeling. With so many towering trees, the park had a cool and green feel. 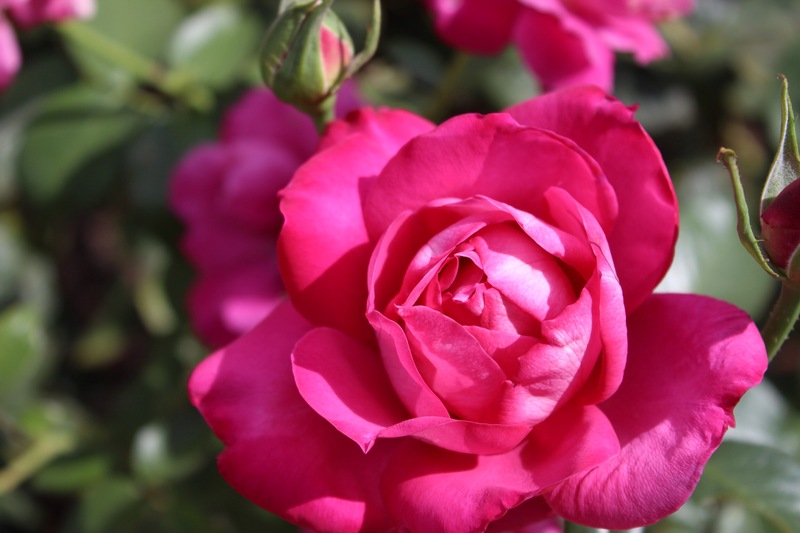 Fragrant rose gardens showed that this was the pride of the city, whilst the crystal palace and museums showed its cultural side too. Far from the serenity of the park, we came across a tribute act of AC/DC, Eisi Disi, who were performing all the greatest hits with convincing outfit and voice, then reeling off Spanish crowd pleasers in between. 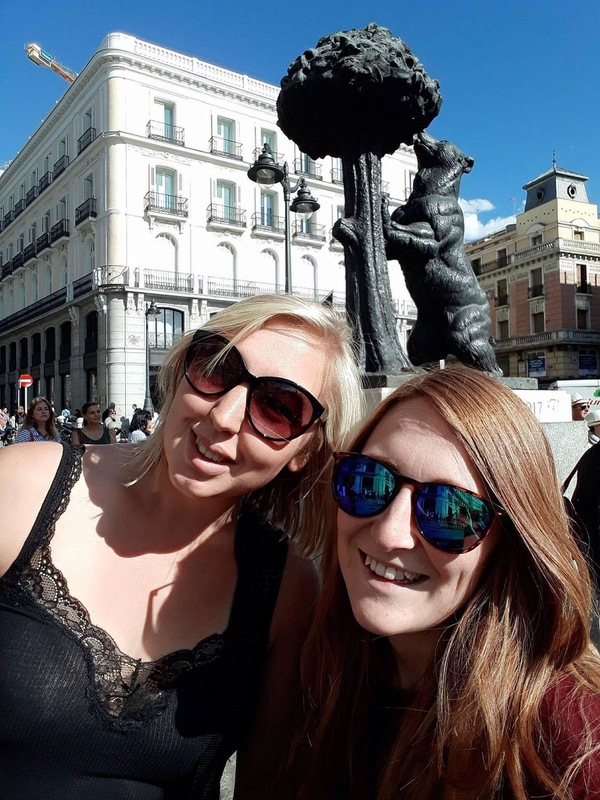 We strolled slowly across the city passing the Plaza Del Sol, a sun shaped ‘square’ with the streets filtering off like rays. 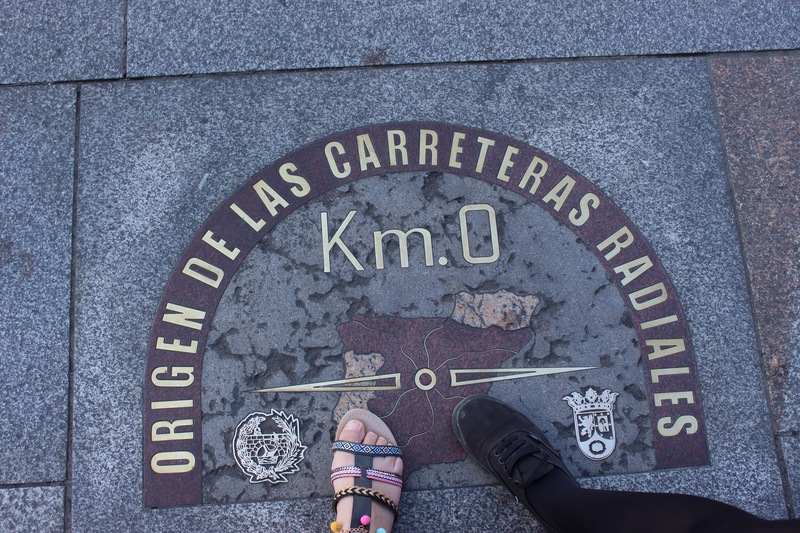 From the centre stone, each kilometre is measured, here being point zero. 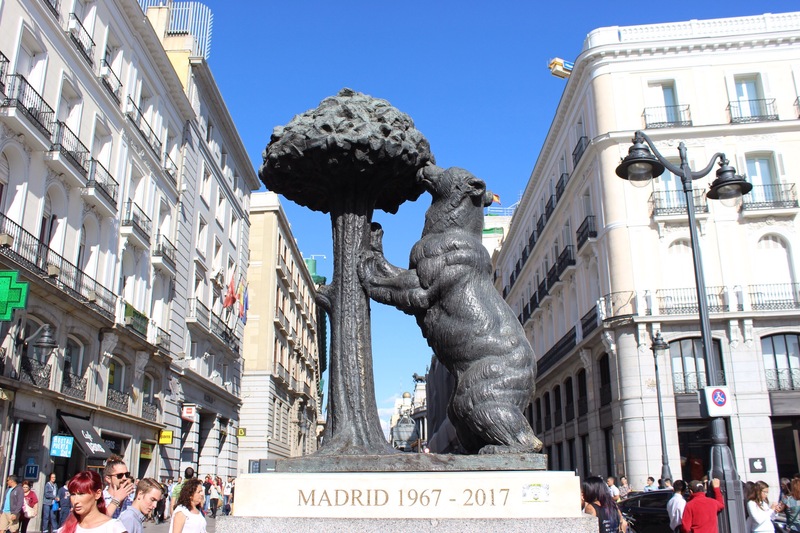 The icon of Madrid, the bear eating the berries, is a historical symbol to the Bears residing in this area and getting slightly drunk off the fermented fruit in the trees. Maybe the relaxed city lifestyle pervades the traits of this dosey bear. In contrast to this lovely image, the square is often packed, today with protests against bull fighting. It was interesting to encounter this rebellion against what is paraded as part of Spanish culture, a suggestion that it is not uniformly popular. 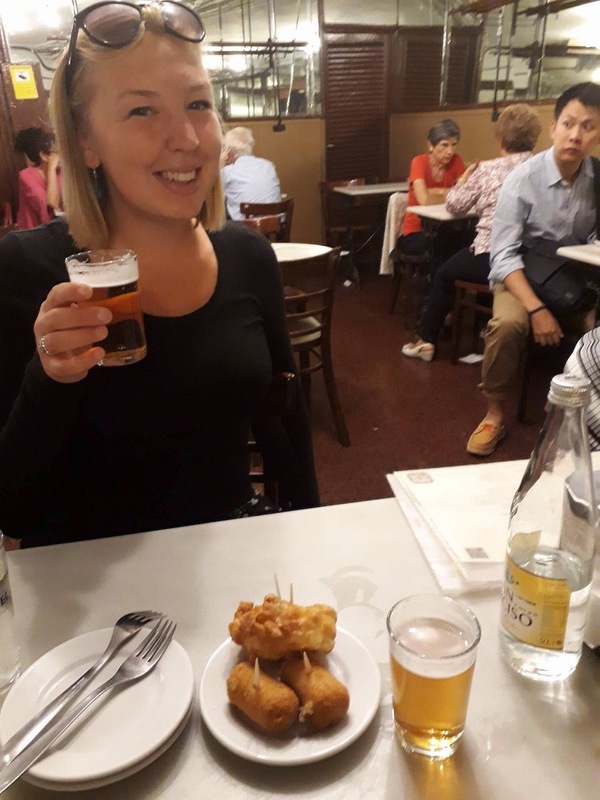 On our final night in Madrid we had dinner at Case Labre. It was the style of an old school building, functional but not beautified in many years, still each table was packed. 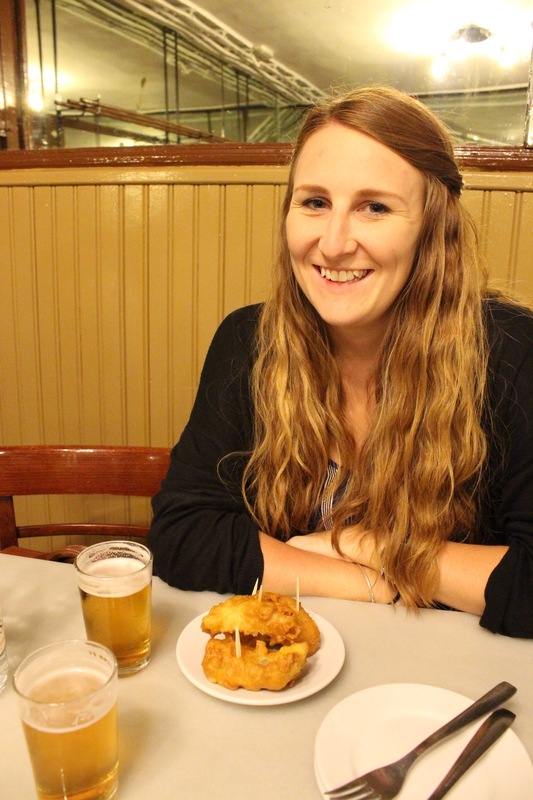 We got a selection of dishes including Monchego cheese, which literally was just a plate of cheese, just another reason to love Spain! In the morning we had one final viewpoint to attend to, the top of the cathedral. 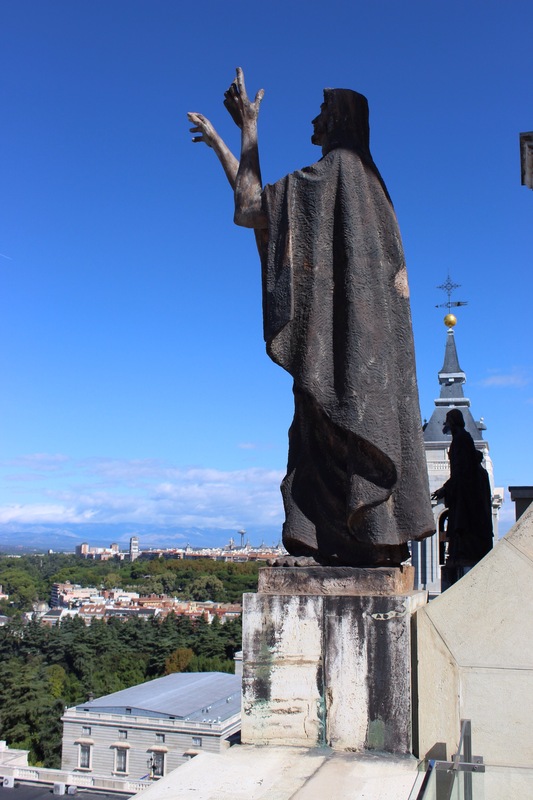 With its vantage point over the royal palace, we climbed to the dome of the cathedral and admired the far stretching suburbs of the city to the foot of the hills. 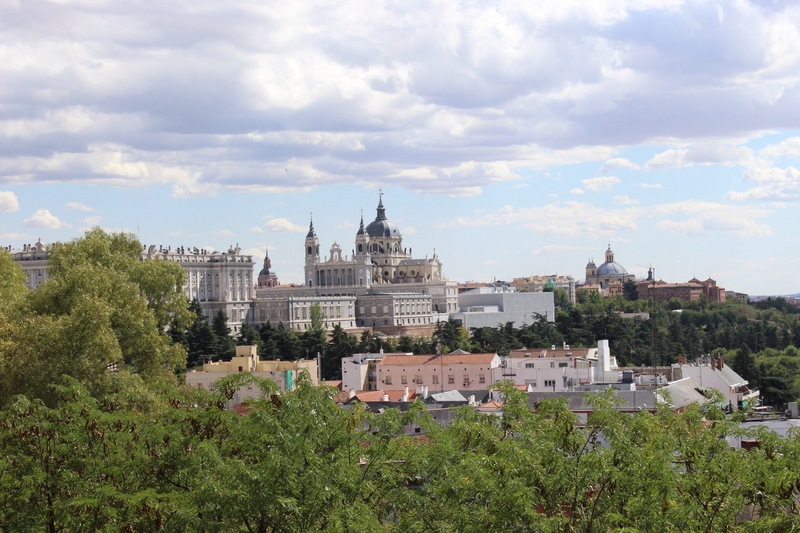 Madrid already felt strangely familiar for a capital, easy and welcoming to explore, colourful but understated. All too soon it was time to bid it goodbye, Stacey home and me, a long bus ride south to Granada. Why go? History and colour form the basis of this relaxed capital. Signature dish: Late night Churros con Chocolate… Yum! 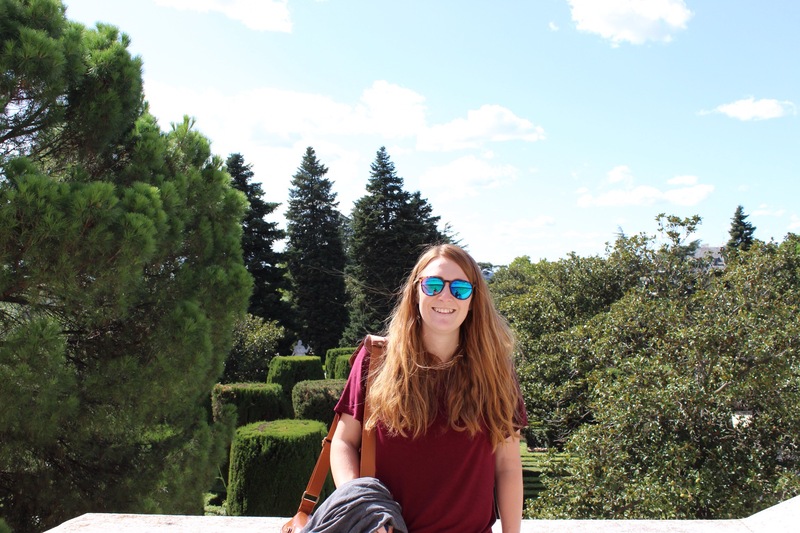 Money: Euros, cheap to drink, eat and visit most of the cities attractions. Where we stayed: We stayed at OK Hostel, cheap, central and very welcoming! Transport: The central attractions are easily connected by foot and it’s lovely to get lost amid the buildings of Madrid. That being said the metro is easy, cheap and quick to connect the points of the city and the airport. 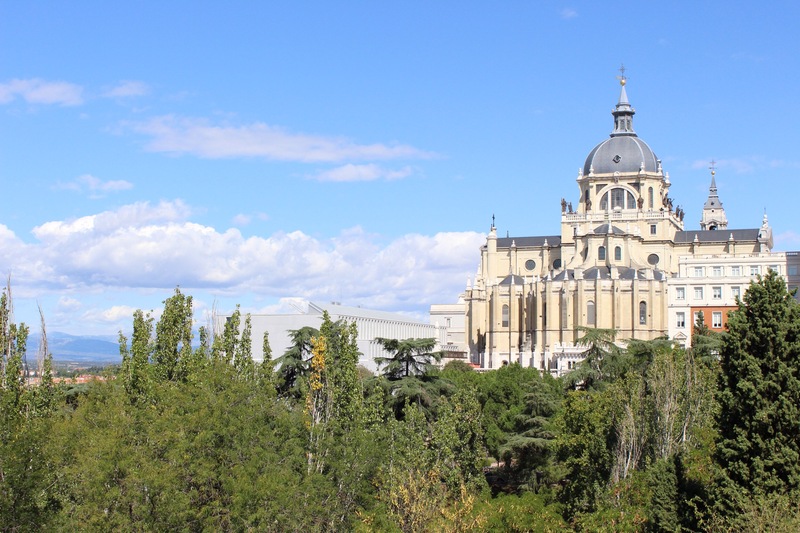 Attractions: Dome of the cathedral, El Retiro park, people watching in Plaza Mayor.